Students often think that because they can type a phrase into Google or saying something aloud to Siri they know how to search. Of course, any teacher who has heard a student say "Google has nothing on this" or "there's no information about my topic" knows that students don't inherently know how to search despite growing up in a world filled with Google and Siri. 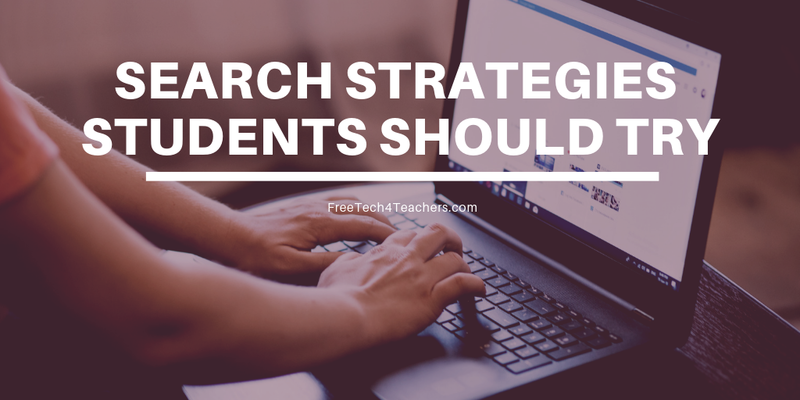 When your students need help formulating or refining a search, have them review the following ten tip. Better yet, have them review these tips before starting their next searches. 1. Ask your teacher-librarian/ school librarian for help. He or she can probably give you access to databases that aren’t otherwise publicly accessible. He or she likely knows more about search than anyone else in your school building. 2. Search is a thinking skill just as much as it is a technical skill. Take time to stop and think about your query terms before typing your query into the search box. Account for all information that you have when you are formulating your queries. 3. Brainstorm alternative words and phrases. Think about the words that other people might use to describe the same topic. Turn to your notebook or textbook to find words and phrases associated with your topic. 4. Use a pre-search checklist. Did you brainstorm alternative words and phrases? Did you check in your notes for clues that can help you in your search? Did you make a list of things you already know about your topic? If not, do that now before typing your query into Google. 5. Try alternative search engines. Google.com is not the only search engine that you can use. Ask your librarian about databases that you can access through a school account. Try Google Scholar, Bing, Wolfram Alpha, or Duck Duck Go. 6. Look within your search results. This means actually clicking the links on the search results page and reading through the pages. If a web page or document is particularly long, use “control+F” on a Windows computer or “command+F” on a Mac to search for specific words and phrases within a page. 7. Refine your Google search according to file type. Web pages generally rank far above documents, spreadsheets, slides, and Google Earth files in search results. That doesn’t mean they’re not valuable. In fact, they can be more valuable than some web pages that appear at the top of search results. Open the advanced search options in Google and scroll down to the field that lets you search according to file type. You can then search for PDFs, Word Docs, PowerPoint, Excel files, Google Earth (KML) files, and RTF (Rich Text Format) files. 8. Refine your search results according to date. On a Google search results page you can open the “tools” menu and specify that you only want results from sites that have been updated within a particular time frame. 9. Refine your search results according to domain. By default Google will serve up results from any site that ranks in its search algorithm. You can narrow the scope of your search by using the advanced search menu and entering a top-level domain in the “site or domain” field. Some examples of top-level domains are .edu, .mil, and .gov. Every country has its own top-level domain too. Canada’s top-level domain is .ca. Refine a search by using .ca in the “site or domain” field in Google’s advanced search page and you’ll only get results from sites based in Canada. 10. Combine strategies. Using each strategy on its own can help you get better results and find what you’re looking for. But combining multiple strategies like refining by top-level domain and file type can help you get more specific results faster than just scouring the web one search results page at a time.